The Powerball jackpot winners from Southern Oregon say they have been unfairly portrayed in the national media. The claim came after The New York Post reported that Steve and Carolyn West of Medford and Bob and Frances Chaney of Jacksonville demanded amenities such as a private jet, Broadway tickets and a limousine tour in exchange for an exclusive interview on the NBC "Today" show. 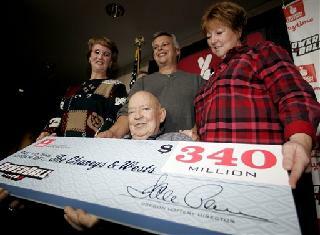 The two couples won a record $340 million Powerball jackpot on Oct. 19. But a spokesman for the family told the Medford Mail-Tribune newspaper that the Wests and the Chaneys were just inquiring about protocol for appearing on a national television show, something they'd never done before. "That's what it was, it was asking 'What do you do? Do you do this? Do you do that? We didn't know," the spokesman said Friday. "Is that asking for things? Is it demanding things? The lottery winners are scheduled to appear Monday on "Good Morning America," an ABC network representative said. The family spokesman, who declined to be identified, said correspondence from the marketing director for the multi-state firm that runs Powerball games was leaked to the Post, perhaps in retribution after the Wests and Chaneys decided to appear on the ABC show. Bob Chaney, seated, is joined by, from background left, his wife, Frances Chaney; son-in-law, Steve West; and daughter, Carolyn West; as they hold a ceremonial $340 million Powerball check at the Oregon Lottery Commission.